aviosupport takes great pride in supplying the highest quality products to the airline industry. Our Quality Assurance and Shipping Departments are dedicated to ensuring that all products shipped from our facility meet applicable regulatory requirements, including the FAA and ASA. 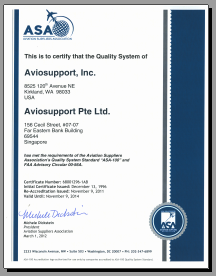 The Aviosupport Quality System is approved by the Aviation Suppliers Association to their ASA-100 Standard and FAA Advisory Circular AC 00-56 for the Voluntary Accreditation of Distributors. No Additional Charges for Certification. Aviosupport Certification of Conformance, Manufacturer Certification, 8130-3 Tags / EASA Form 1 and FAA/PMA Supplement Letters are available to all customers. Aviosupport maintains a staff of Certified Hazardous Material Handlers that are qualified to ship hazardous materials per CFR 49 and IATA dangerous goods regulations via all modes of transportation.